"My family loves this recipe. 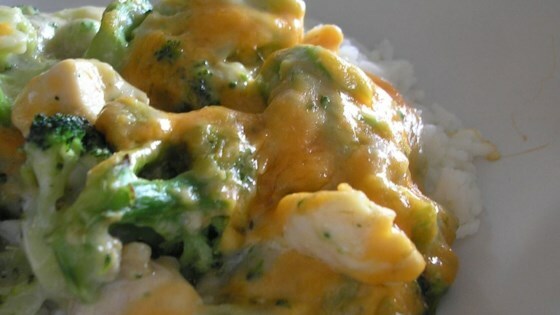 My kids love it because the broccoli is 'hidden' under all the chicken and cheese! This is an excellent way to use up leftovers." Place broccoli in the bottom of a 9x13 inch baking dish. Top with the chicken. Mediocre at best. Canned soup in the sauce gives this an artificial taste. I'll do the the work and make the "old fashioned" recipe, which is delicious. I absolutely love this recipe, I have basicly used this recipe years. I use a topping of mozzerella and add herbed breadcrumbs and butter for a golden topping, and my niece and nephew love it! My kids loved this dish! I used cream of celery soup instead of cream of chicken and added some french fried onions. Delicious! Excellent flavor. You need to serve over rice or noodles to soak up some of the liquid. I added a little curry for a different flavor.